This chart is showing where the buyers are placed for now, at 1.1180/200, exactly as I pointed in my previous EUR/USD analysis from June 09. But, how much they can hold this line of defense? We can see, that the sellers are serious and they don’t give the opportunity to recover today. On the other side, theese three up trend lines are pointing at possible retrace from this level. Could it happen? 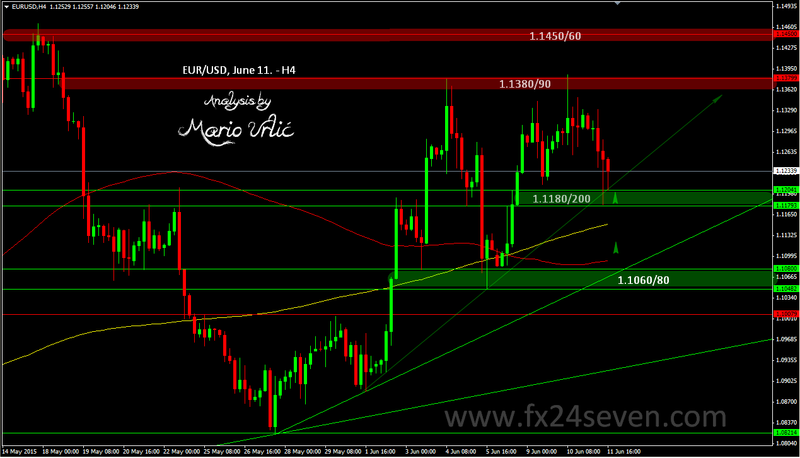 On the way down, if the pair broke 1.1180/200 today, there is several MA’s before serious buyers teritory at 1.1060/80. On the way up, H1/MA100 is holding the pair for now at 1.1243, there is minor resistance at 1.1280/300 and previous strong resistance at 1.1380/90.